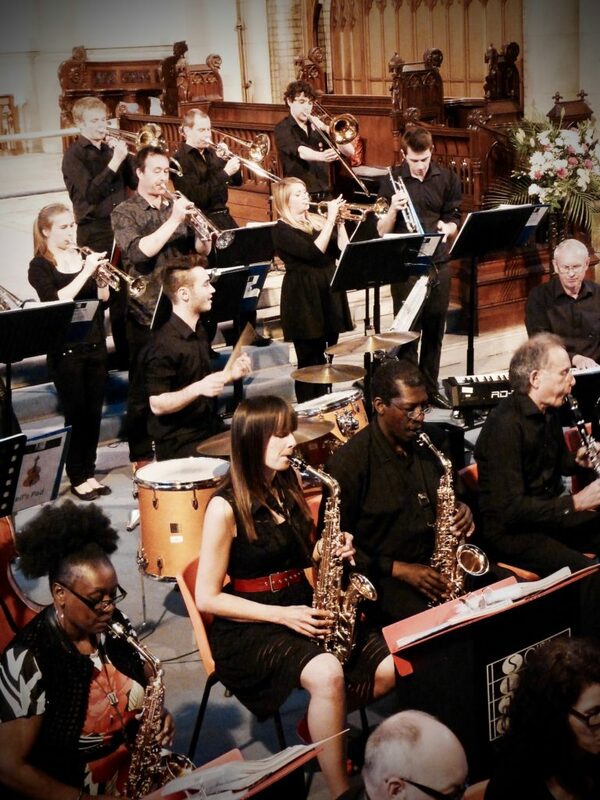 As a large jazz orchestra, we offer music for clarinets, saxophones, trumpets, trombones, guitars, keyboards, bass, drums and percussion, and sometimes feature flutes and piccolos too. We also offer vocal numbers performed by our in-house singer. We welcome all newcomers with or without experience of swing music, and do not hold auditions for any instrumentalists wishing to join. We do, however, recommend a playing ability of Grade 5 or equivalent, and a basic level of reading music to ensure you get the most out of performing with us. We always try to accommodate additional players, and every member of the SLJO is invited to perform at most of our gigs. Our rehearseals are held on Wednesday nights throughout the year, running from 8pm until 10pm, but we start setting and warming up from 7.30pm. 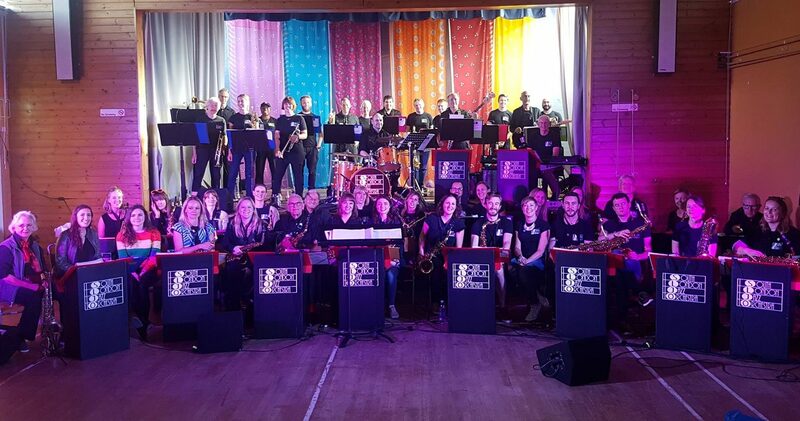 As well as full SLJO rehearsals, we also hold sectional rehearsals, usually with specialist tutors, and occasionally run masterclasses on improvisation and playing techniques, to help us improve and develop our musical skills individually and as a group. If you’d like to come to one of our rehearsals, please fill out the form here, or email sljo.secretary@gmail.com and let us know you’re coming. A great gig like the Brighton Fringe Festival makes all the hard work at rehearsals worthwhile. CHURCH: MOSTYN ROAD METHODIST CHURCH, MOSTYN ROAD at ST LAWRENCE WAY SW9 6PH (off Brixton Road – tyre shop is on the corner of Mostyn Road/Brixton Rd). It is two minute walk to the church. PUBLIC TRANSPORTATION: Buses, whether coming from the direction of Elephant/Castle or Oval or North of the river -OR- from Brixton/south London direction, use GROVEWAY Bus Stop (same name, both sides of Brixton Road – USE CAUTION CROSSING BRIXTON ROAD) Groveway is served by bus lines: 3, 59, 133, 159, 415, Night buses as well. PARKING: Along Mostyn Road is okay, but not within St Lawrence Way complex; note, after passing church, Mostyn Rd becomes one-way, so at bottom of road turn left and left again to access parking which appears to serve new apartment blocks. IMPORTANT: the entire area around the newest buildings is sign posted “restricted parking”. Research indicates that this is to indicate that one is restricted to only parking in (white lines) marked bays. It is not an exclusion zone. Another access point to this large parking area, if entering Mostyn Road from Brixton Rd, is to take the first left turning, just before the church. The largest parking areas will appear on your right. Some of the streets with parking bays are Crawshay Blvd., Eleanor Road, Dundas Rd., Bramah Rd. and Fountain Place. Finally, an alternative to a Brixton Road approach, is Loughborough Road northbound, which becomes Akerman Rd, jntersecting the one-way end of Mostyn Rd. , continue past Mostyn Rd to the first left turning, which will take you into the area with parking bays.